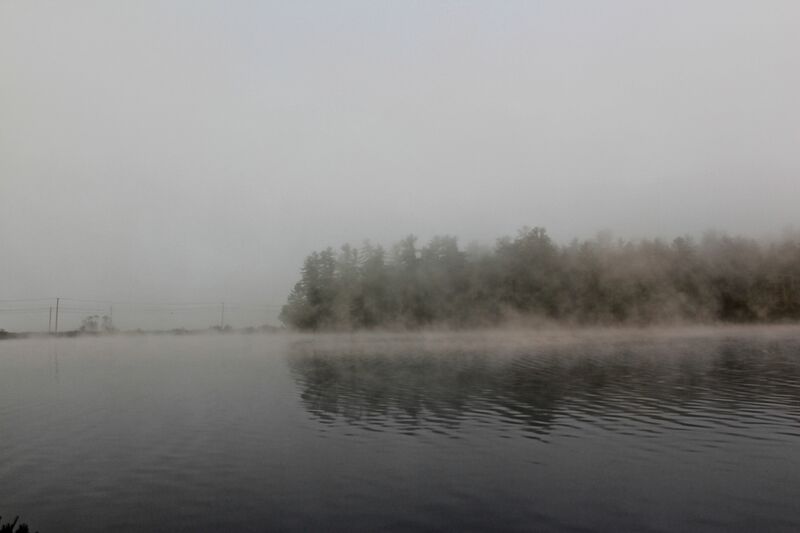 Morning fog embraced Pleasant Mountain, making it only a memory. 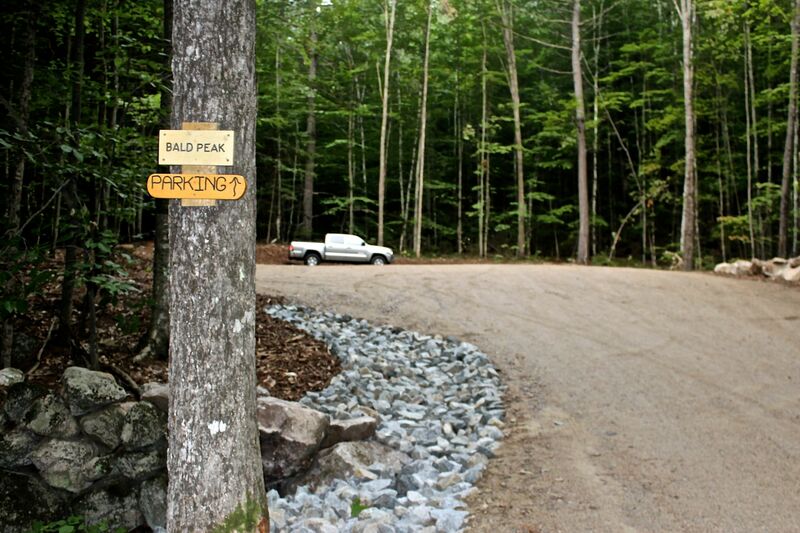 In my need to know that it was still there, I drove down Mountain Road to the brand-spanking new Bald Peak parking lot. I guess I was early since my truck was the lone vehicle. 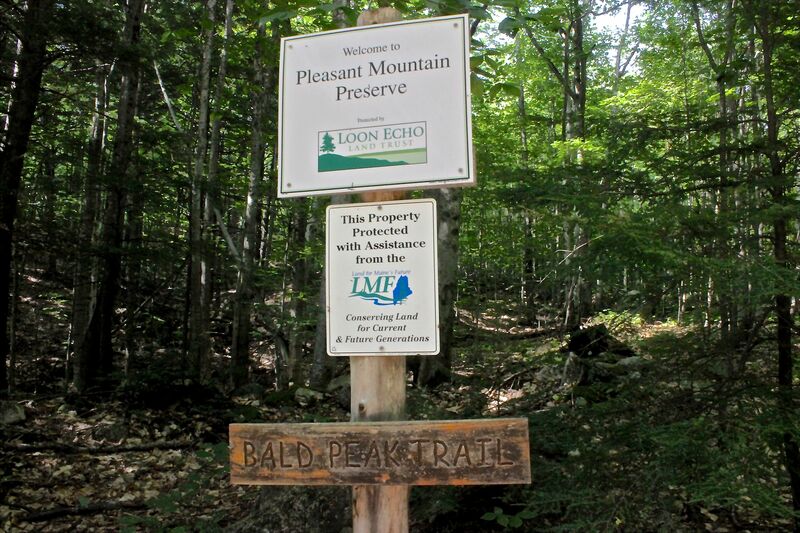 Thanks to Loon Echo Land Trust and the AMC, the Bald Peak trail has undergone a transformation this year. 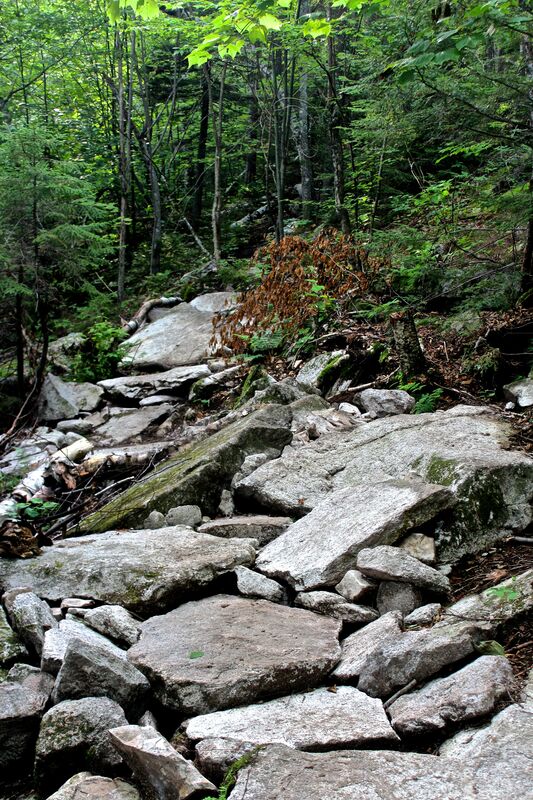 More stairways, a new path and switchbacks make for an easier climb. Um, that’s all relative. 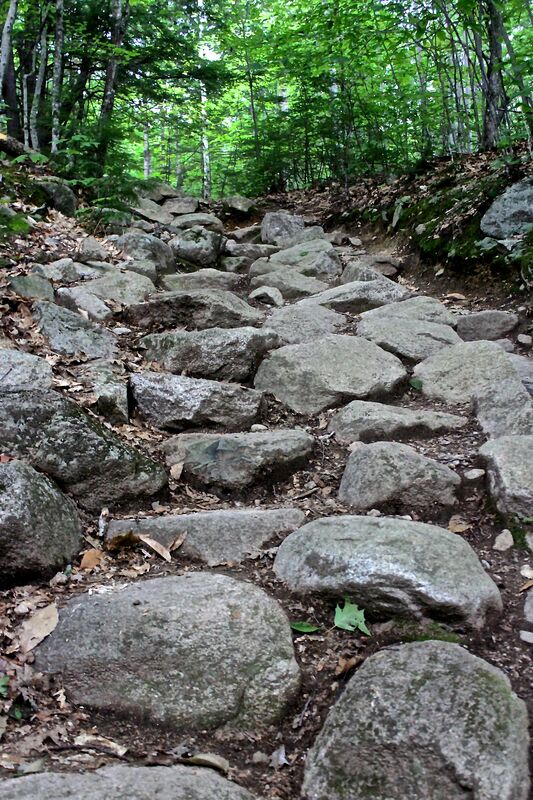 It’s still moderately challenging compared to the other trails on the mountain. 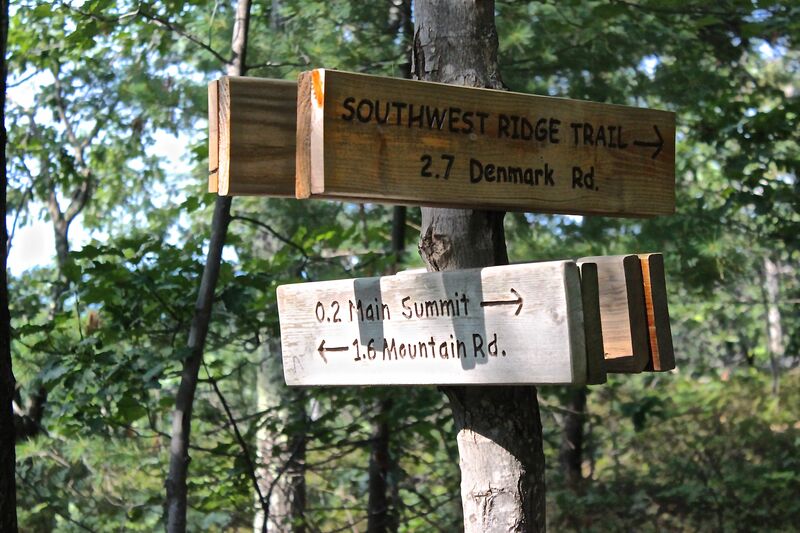 Trail signs mark the way, giving a sense of direction and distance. I’m a bit out of order with this photo, but that’s my nature. Near the start is this debarked birch. People have carved their initials to note their presence. 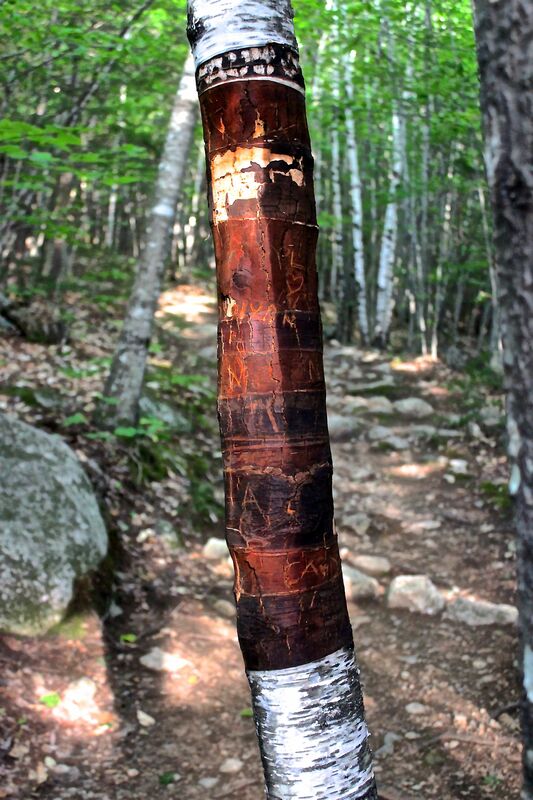 I know I occasionally post photos of beech trees with carvings, but the fact that someone took the time to peel the bark off this tree bothers me. Please leave bark on trees. I know it peels easily on birches, but the tree will shed its bark when it is ready. For us to peel it is like someone peeling off a layer of skin. Shivers run up and down my spine as I think of that. Bark is the tree’s form of protection from the elements. ‘Nuf said . . . I hope. 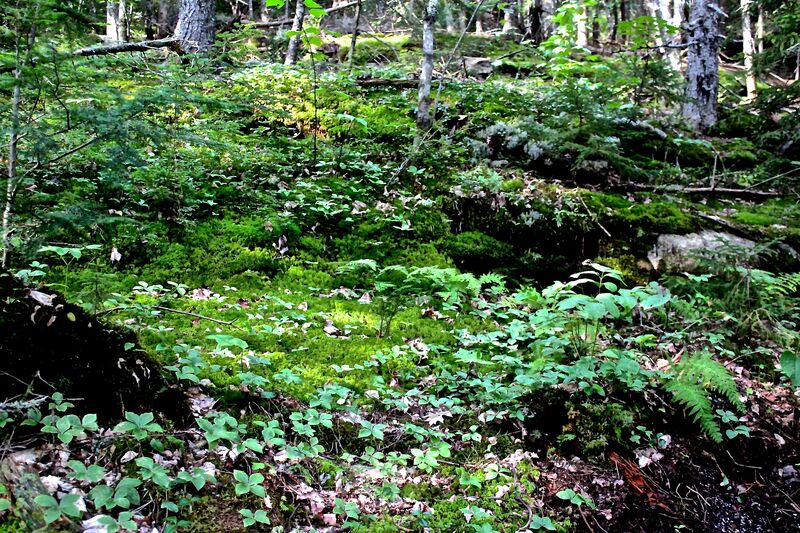 I pause beside one boulder where lichen, mosses, wildflowers, ferns and even a striped maple tree have made a home. 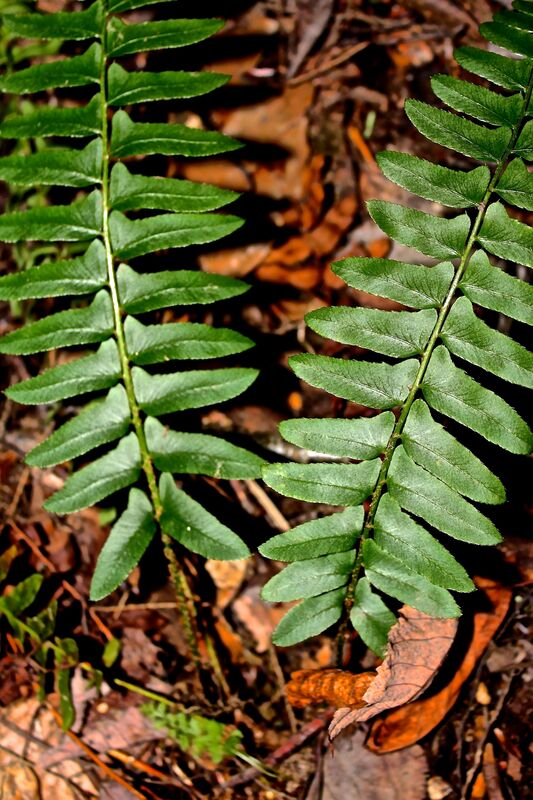 Christmas fern–do you see the shape of the leaflets or pinnae? Little Christmas stockings or boots? Some say Santa sits in his sleigh with the reindeer before him. 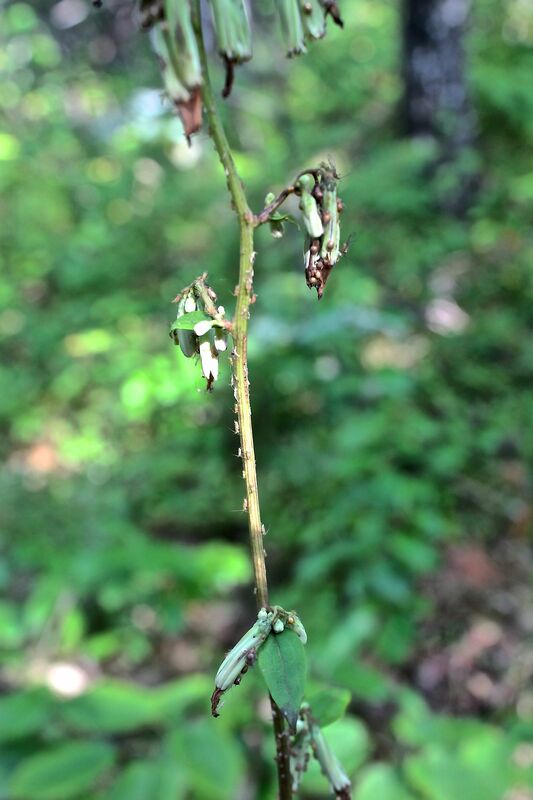 Each leaflet is attached to the main stem via a short petiole. 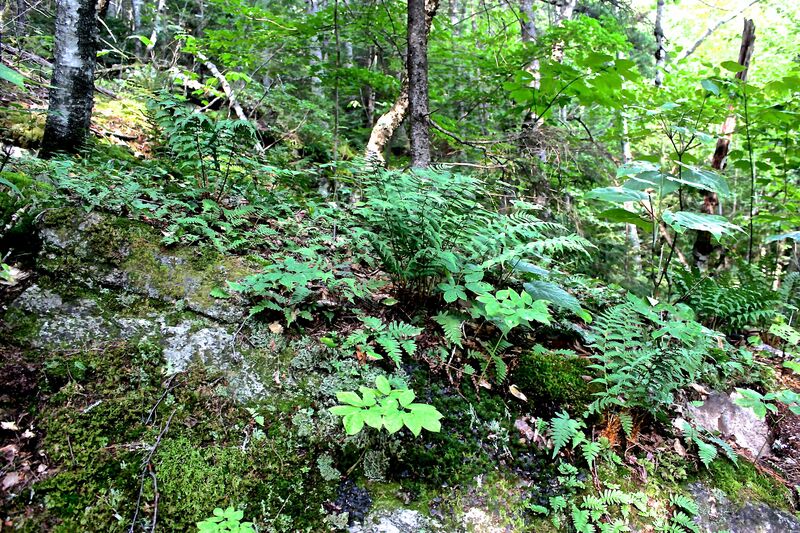 Polypody fern loves to give rocks a crazy-hair-day look. 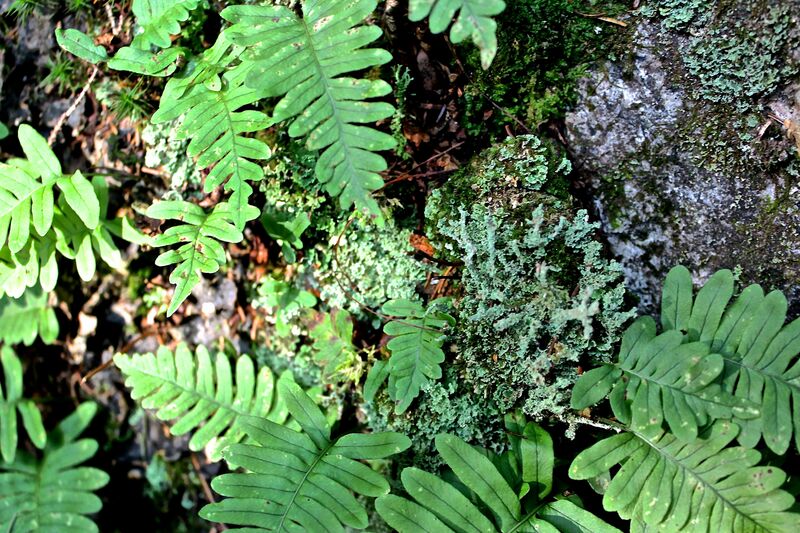 While its leaflets look similar to that of Christmas fern, they attach directly to the main stem and give the entire blade a rather ladder-like appearance. 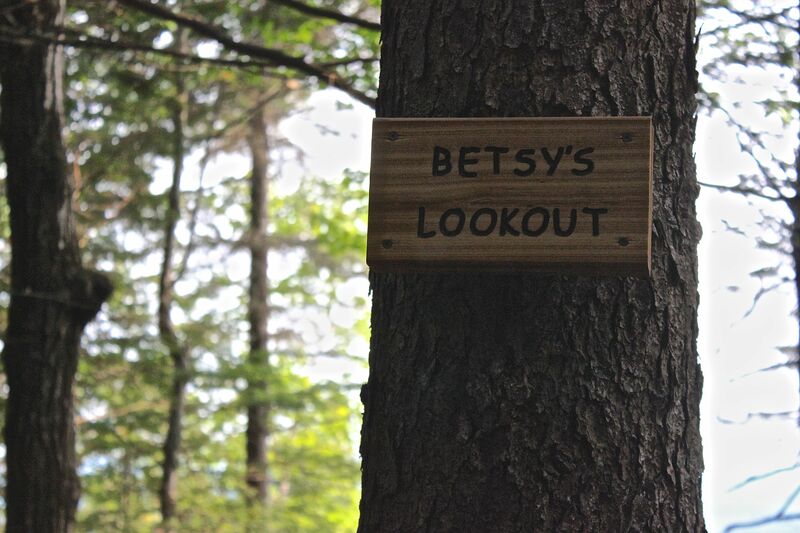 I’m not sure who Betsy is, but along the path, there is a new cutout providing a bit of a view of Moose Pond below. 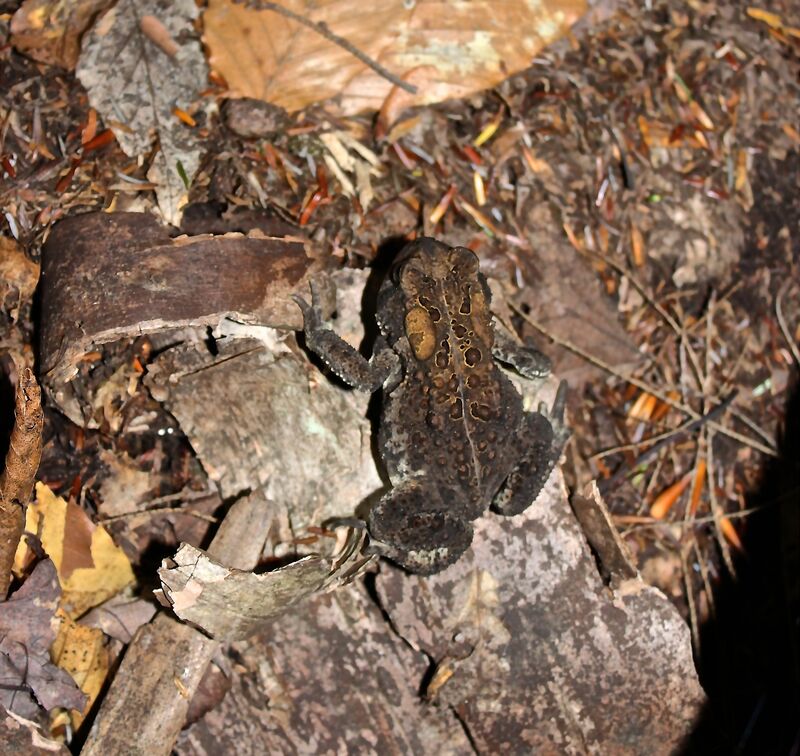 Before I hiked onto the ridge, an American toad paused for a photo op. Out of the fog. 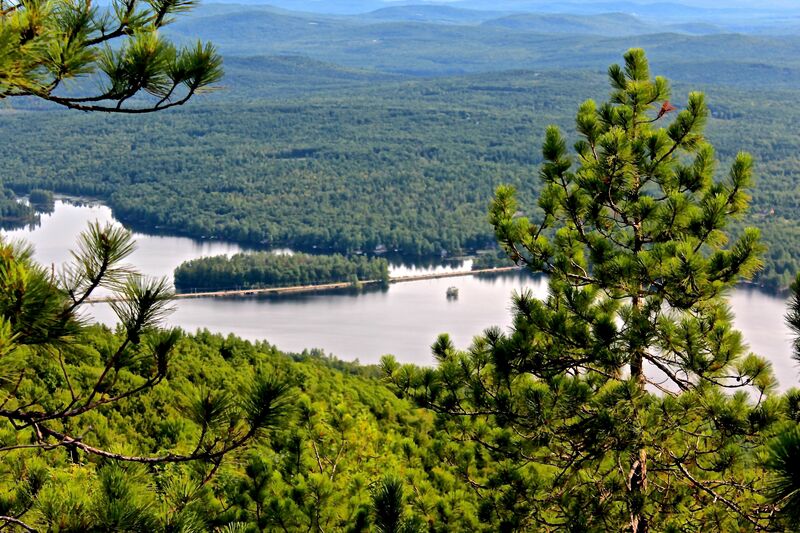 Camp is about smack-dab in the middle of this photo on the north basin of Moose Pond. I met no one as I hiked up and only encountered two people and their dogs along the ridge trail heading toward the summit. 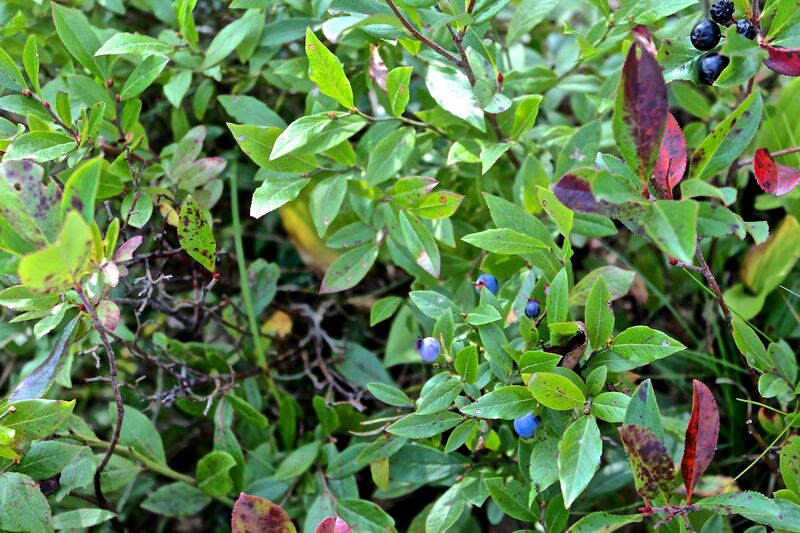 There aren’t too many blueberries left, but the huckleberries are abundant–and seedier. 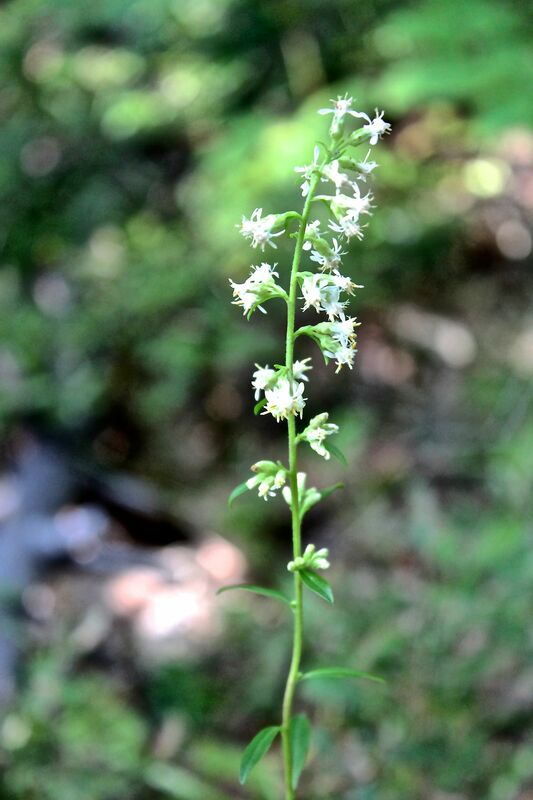 Also plentiful–Gall-of-the-Earth or Rattlesnake Root (Prenanthes trifoliata). Such a curious name for this plant. Hilary Hopkins writes in Never Say It’s Just a Dandelion, “Gall-of-the-Earth: a mysterious name dating from at least 1567, referring to a plant’s bitterness, though not this plant, but rather one said to have been discovered by Chiron the centaur, a physician of Greek mythology.” OK–so if not this plant, then why the name? 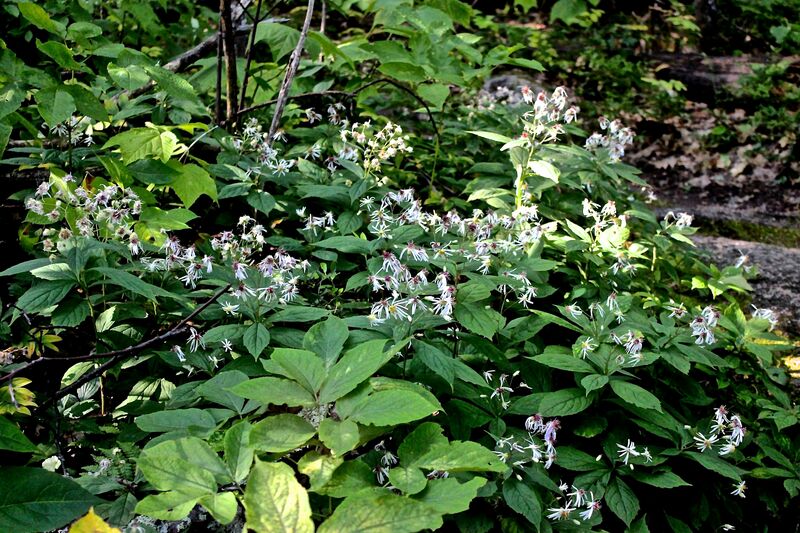 Hopkins continues, “Rattlesnake Root refers to the plant’s supposed efficacy against rattlers.” Always good to know I have a tool handily available when hiking alone. 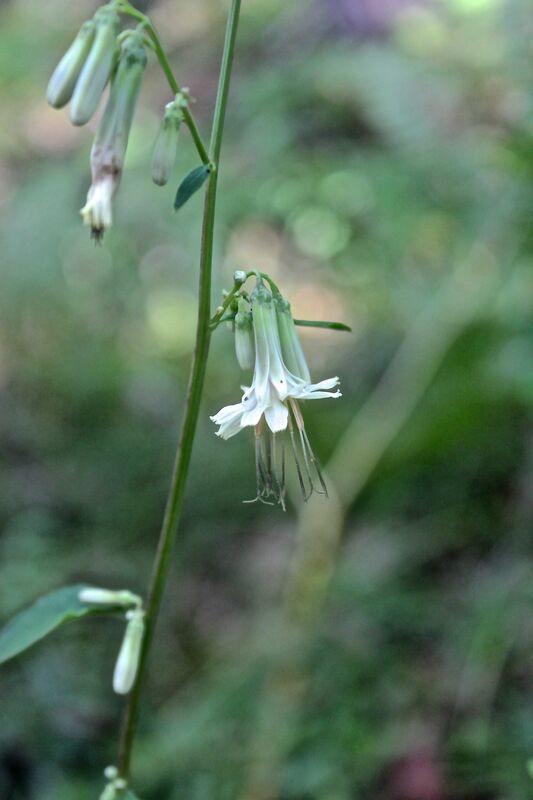 And finally, she writes, “Prenanthes means ‘drooping flower,’ a perfect description; trifoliata describes the three-parted leaves.” That is definitely accurate. 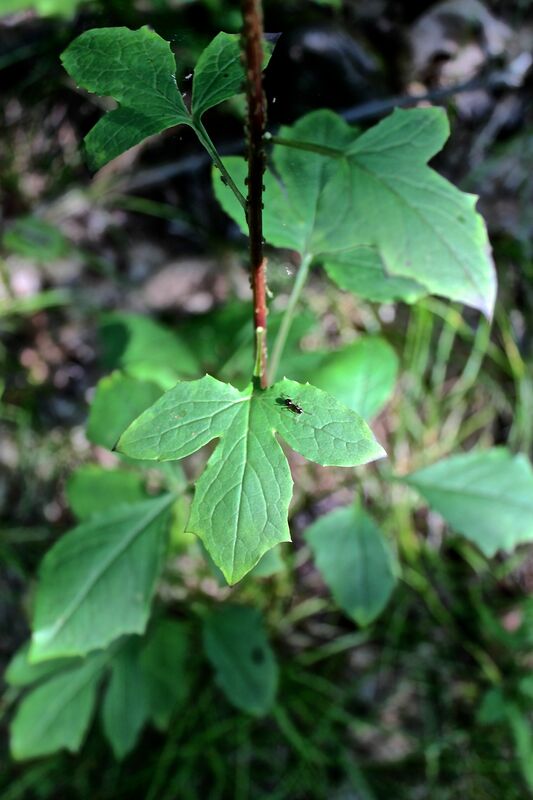 Though I saw numerous Prenanthes trifoliata along the trail, only this one was covered with aphids. And one ant. It is said that ants herd the aphids, protecting them from predators and parasites, so that the ants can enjoy the honeydew left behind by the tiny insects. This ant must have had sentry duty–he roamed all over this leaf and then down to the next one. 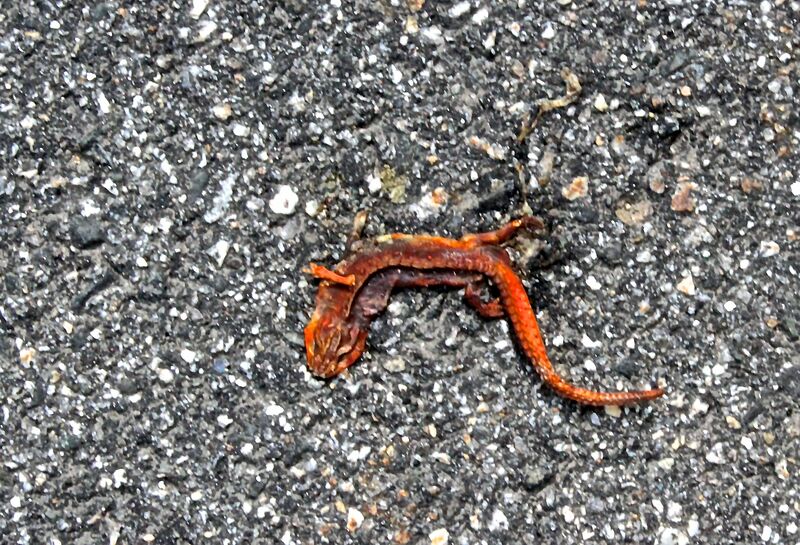 Perhaps he thought I was the predator and he had to keep an eye on me. Whorled Asters graced the trail periodically and the base of a Northern Red Oak. 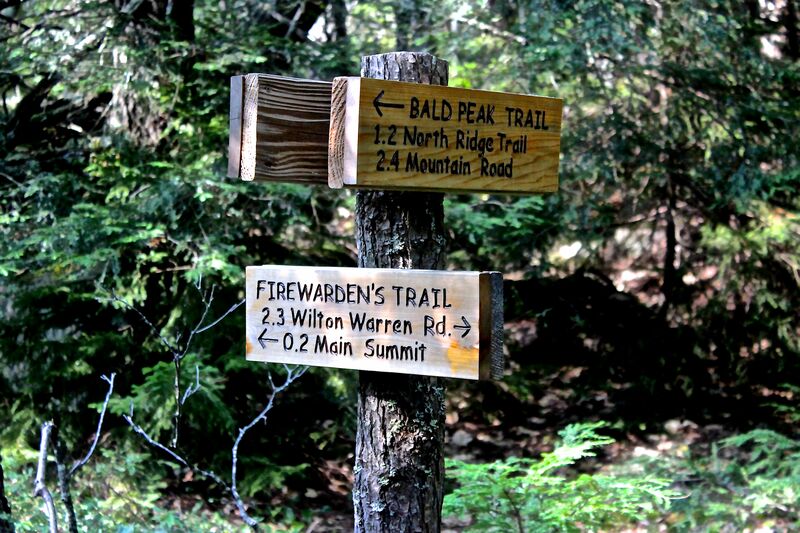 Moments before I reached the Firewarden’s Trail, I startled a red fox that ran into a rock den. 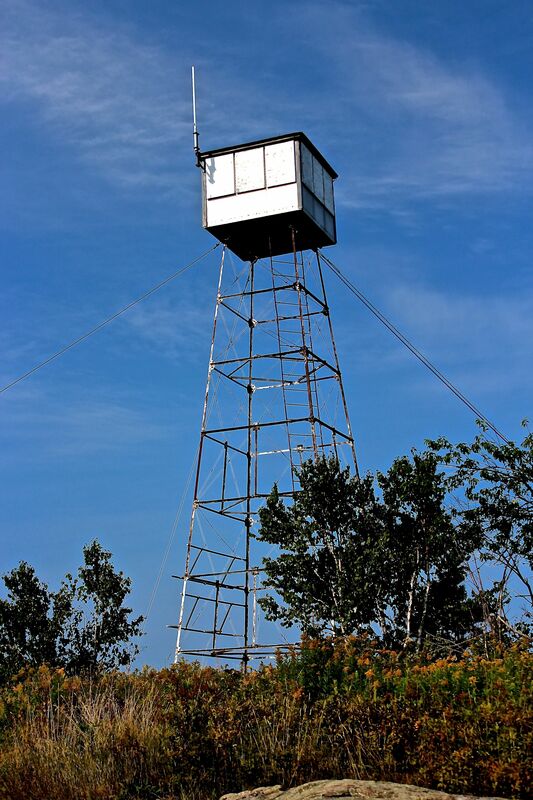 Standing forever stalwart is the fire tower. 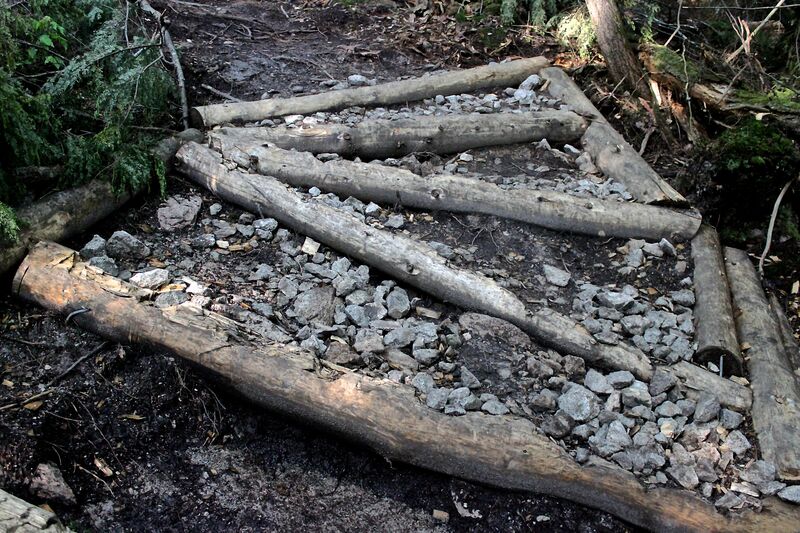 I hope it will continue to stand tall forever, as it marks a piece of the mountain’s history. Out of the fog. Looking west from the summit. 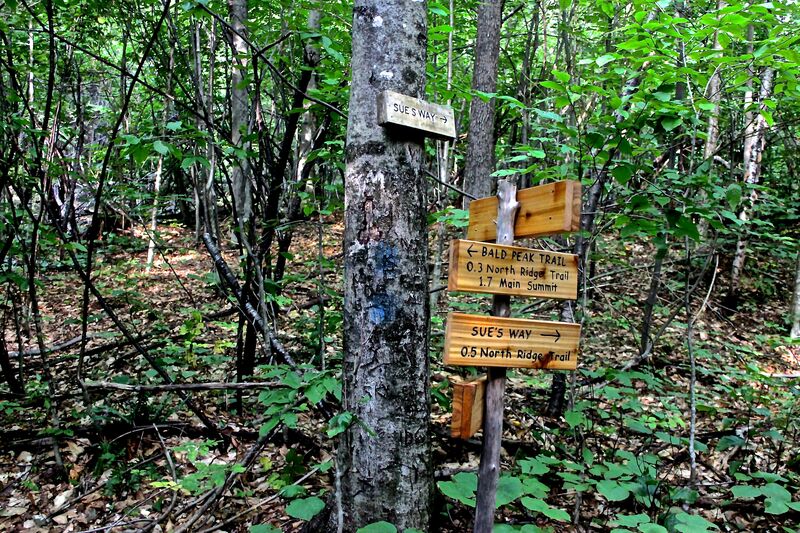 There was a time when one could easily get lost on this mountain, but thanks to the LELT, those days are no more. Good thing. 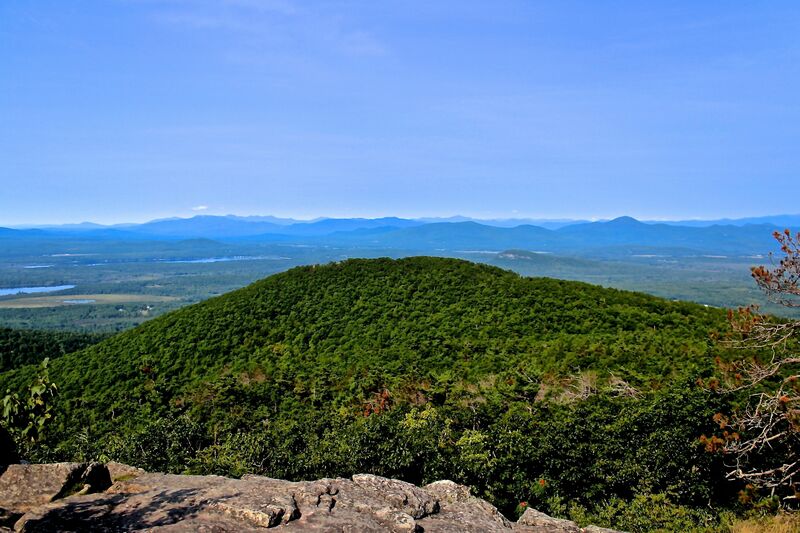 There were six people at the summit and I passed quite a few more as I descended via the Ledges Trail. Silverod is our only white goldenrod and it prefers the drier soil of this path. 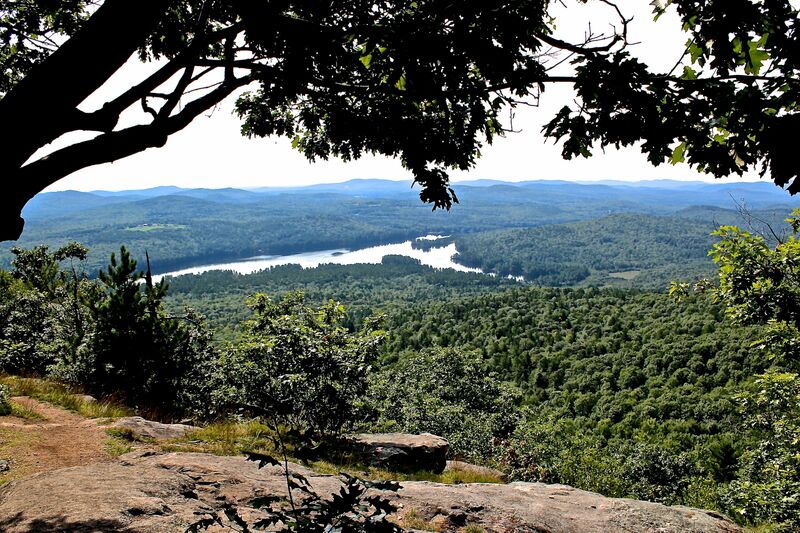 The ledges offer a peek at the south basin of Moose Pond. 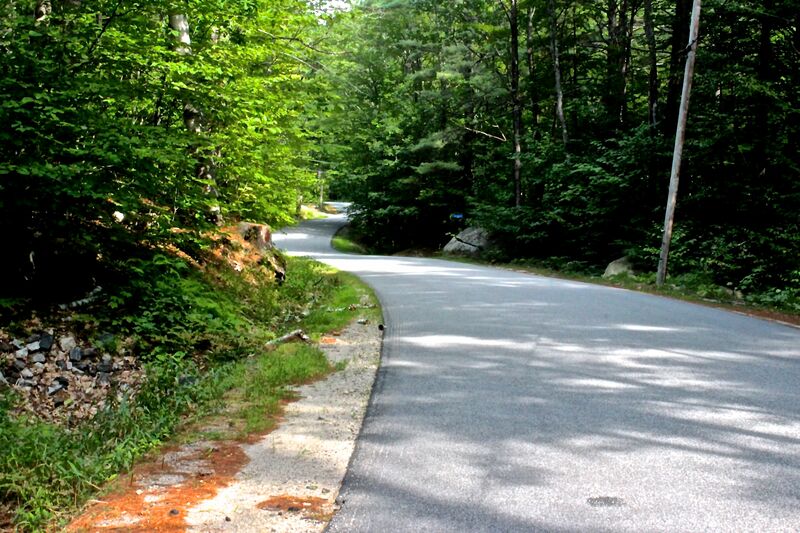 Finally, I was back on Mountain Road for the 1.5 mile walk back to my truck. And so it was today that I’m glad I climbed out of the fog. Thanks for joining me on this long wander. Love it! Another place to explore next summer when we return once again. Interesting about the rattlesnake root….I put 2 stalks of it in a flower arrangement that I created yesterday, now I know what it is! 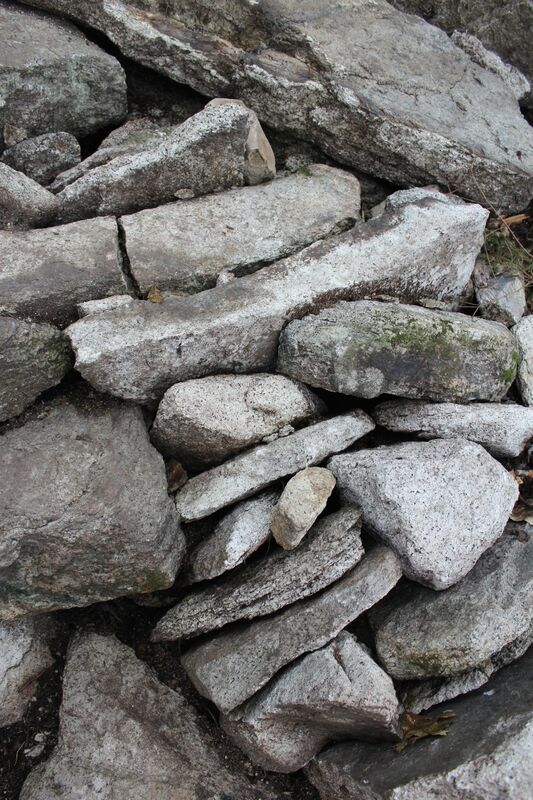 Thank you, Leigh, for sharing your blog with us. Hope to wonder and wander your away many more times! Don’t leave yet, Faith! September is made for wandering and wondering! Thanks for the hike! Your post made me feel like I was there with you! You were, weren’t you? One of these day, yup, one of these days. Gall-of-the-Earth seems to grow anywhere, Ursuala. 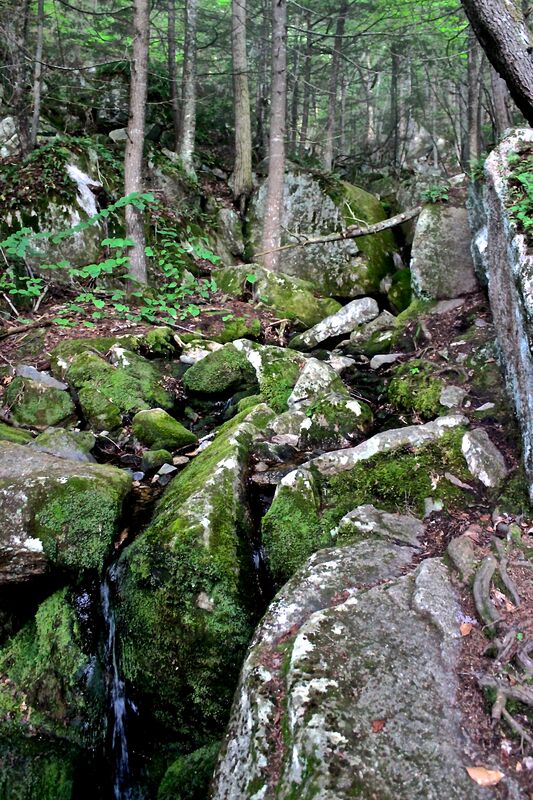 I saw it in shaded areas along the trail, and then again in the sun along Mountain Road. It is a very descriptive and informative account of your wander. Maybe this is the new way to walk in different countries without the cost of airfare. Thanks for stopping by to wander up the mountain with me. 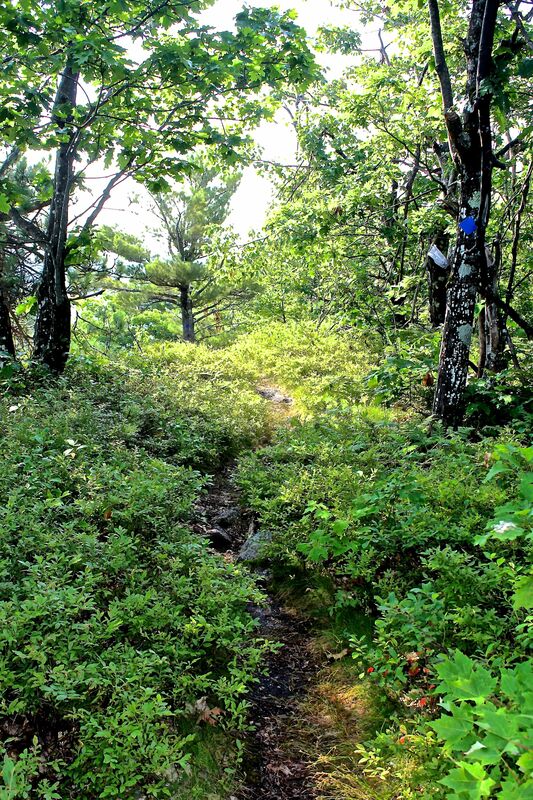 I hope you’ll join me again in the near future to learn more about this beautiful area of western Maine.